The planet continues to cool after an El Niño induced string of warm years | Watts Up With That? This thread will be updated when UAH issues their official press release. Tropics: – 0.12 C (about 0.22 degrees Fahrenheit) below 30-year average for January. February 1, 2018 in Climate data. ← New Paper: "Reconciling divergent trends and millennial variations in Holocene temperatures"
Do we start a new pause? Or does the temperature lower enough to continue the old pause? As long as it is a pause and not an extended cooling trend, I’d be happy. It will take cooling to finally destroy the CAGW beast, but cooling kills people and causes crop failures so I’d rather it stay about where it is. It will take direct targeted lightening strikes against specific persons to destroy the CAGW beast, just look at Mann’s recent comments about the cold weather in the East or any of the nonsense that comes from the facial portal of Algore. Agree with you OweninGA, but the sad fact is that it IS coming. Four feet of snow in Tehran and snow further south in Iran; snow in the Sahara for the second year running; snow in southern Morocco; a few years ago cattle were found frozen to death in South America; the USA caught in a deep freeze that extends down to Texas. We are at the end of the current interglacial. Please send CO2….. Even that won’t stop them. They (Hansen et al) are now saying that there might be a decade or two of cooling but that CO2 will come back and be a huge problem. They just move the goalposts. We will be watching glaciers advance for decades and they will still be bleating about CO2. Am I correct in perceiving that the CAGW cultist dogmatists are intent on forcing “other people” to develop and implement low or no CO2 alternative energy sources while having no intentions beyond sitting back on their dead duffs waiting for those “other people” to ensure they stay warm in winter and cool in summer not to mention be able to make use of air transport when an if it is desired? Science vs. Science Dogma. “There is a conflict in the heart of science between science as a method of inquiry based on reason, evidence, hypothesis, and collective investigation, and science as a belief system, or a world view. Well that is not going to happen. The cooling trend is here and you can see the results of that over at iceagenow who are doing a fine job of collating the extraordinary number of cold events occurring. I am now firmly convinced that the many scientists who predicted this would happen are correct. God alone knows what is coming as a result of this grand solar minimum, but clearly warming is not on the agenda. If it drops another 0.11C then the temp wil equal 1997 (prior to the 1998 El Niño warming). That could be viewed as a possible extension of the “Pause” at that point, though statistically it would require several more years at or below that level for an actual continuation of “The Pause”. So we’re now within .11C of 1997? The fact such piffling fractions and margins are argued about says much of the absurdity of ‘global warming’ hysteria. What a pile of tripe it is. Why years? Wouldn’t half a year or so be enough to eyeball a flat-line in the trend? If it drops another 0.11C then the temp wil equal 1997 (prior to the 1998 El Niño warming). What do you mean by 1997? January 1997 was 0.41C cooler than January 2018, 1997 as a whole was just below 0C, so 0.26C below 2018 to date. Bryan A, it looks to be about the same temperature at January 1998, which was going up, while this one is going down. It has already dropped 0.6C from the 2016 peak and if it was to follow the fall after 1998 it could end up around Zero. makes Jan 2018 the 10th warmest January in the UAH data. Andy, it is worrying that the Tropics is the Heat Engine for the Whole Planet. January 1998 was 0.48C, 0.22C warmer than 2018. By this point after the 1998 peak temperatures were already around 0. January 2000 was -0.27C. Actually in 1997, NOAA claimed the global temperature to be 16.92 degrees C. However, NOAA claims last year’s temperature (2017) to be 14.74 degrees C.
Third warmest year? Not hardley, as John Wayne would have said. Nobody has given an acceptable explanation of how those changes to 1997/1998 came about. Nonsense. Unless you are going to cherry pick individual months. 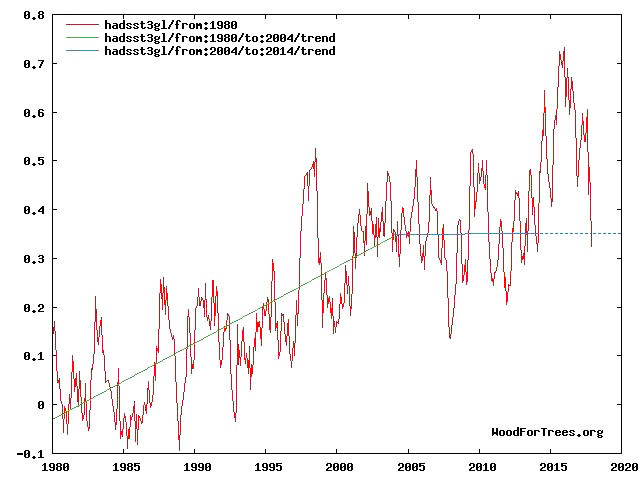 The flakey running average “smoother” that Roy insists on using is a good 0.25 deg C warming than the 1997 peak. I don’t see this index dropping below 0.3 above the ref. period any time soon. There will be persitent warmth from such a long and strong El Nino run. You have no data to establish such a claim. But Tony, look at the tropics. Energy wise that is worth more then the NH since that is winter. What claim? About the pause coming back? Last summer I did a “what if” calculation to see what the UAH temp would have to be over the course of two years to reestablish the Pause at the current level of +0.138 deg. The result was implausible, IMO. The temp would have to be near the coldest point in the UAH record, and *stay* there for two years. Judge for yourself how reasonable that sounds. I did post that graph here at WUWT on one of the comment threads. Nobody commented on it at all, which was surprising to me because the question of the Pause returning always seems to be the question of the day. Anyway, I did note that to cooling for a three year span to reestablish the Pause was more reasonable. But three years is not “any time soon”. Well perhaps you should post it, the data and your rational for your assumption then. Because the temperature is already lower than most of 1998 and so is the 13 month mean, the Earth has already cooled 0.5C from the peak in 2016, so it depends on how you are establishing your “trend”. That is a very important point which i was also making, there will be less warmth to transport to the SH & NH. I’m sure some will. But at present January 2018 is almost exactly on the long term trend line for UAH. How can you have a long term “Trend Line” when the Data shows Step Changes with a Known cause? Including all that El Nino warming, that is the ONLY warming in the satellite data. By “long term trend” I meant a linear fit across the whole data set. You can fit a straight line to any data – whether it’s a good fit is another question. At present I don’t see any compelling reason to assume a discontinuous fit would be better. But if you prefer you could fit a zero trend line between the El Niños, in which case you would have to say that January 2018 is somewhat above that trend line. La Nina is the only cooling. The current stutter (for 13 month mean line) is about 1 month. It’s no good waiting for a step down unless you really have a good cause. Otoh, Hansen just did the three edged forecast warming-cooling-or-hiatusing and said the true warming could be hidden behind some natural variation. Dog ate my warming forecasted. When we look at January temperatures of 2017 and 2018, they suggest that global, southern hemisphere and Tropics temperature decreased but northern hemisphere temperature increased. That means, change in temperature are not global in nature but they are region specific. Global Lower Troposphere (LT) temperatures can be accurately predicted ~4 months in the future using the Nino34 temperature anomaly, and ~6 months using the Equatorial Upper Ocean temperature anomaly. The atmospheric cooling I predicted (4 months in advance) using the Nino34 anomaly has started to materialize in November 2017 – with more cooling to follow. I expect the UAH LT temperature anomaly to decline further to ~0.0C in the next few months. Incidentally, the Nino34 temperature anomaly is absolutely flat over the period from 1982 to present – the only apparent atmospheric warming during this period is due to the natural recovery from two major volcanoes – El Chichon and Mt. Pinatubo. Neither of the above. It was the 10th warmest January in the UAH record and in fact fractionally increases warming trend since 1998 from 0.074 to 0.075 C/dec. 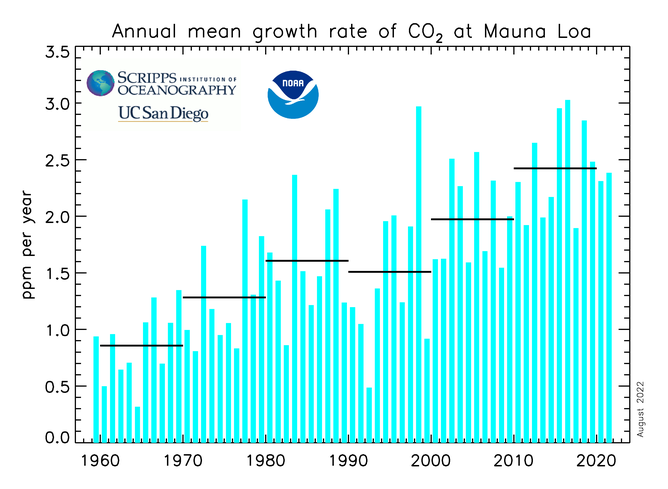 Dropped from the warmest to the 10th warmest, but don’t you worry, CO2 is still a problem. “In the UAH record.” Which, considering how short the UAH record is, means the “10th warmest” is not all that unusual, and is certainly not alarming. Not quite Mark. January 2016 was the warmest January in the UAH record. 2017 was only the 7th warmest. A similar, though more dramatic fall followed the 1998 El Nino too. Even so, in the top 10 out of 40… hardly the onset of a global cooling apocalypse. And as mentioned above, the January figure for UAH actually slightly increases the long term warming trend in UAH by a small margin. Whether that long term trend is ‘alarming’ or not is another question. Interesting that the Tropics have gone to a Minus value while the NH is still +0.46C, even though we have experienced a very cold January. More heat leaving the Planet in the NH. No, cold air sinks and displaces warm air. lts because they include the Arctic in the NH temps anomaly. Take a look at the 30 day temp anomaly map on the google Arctic sea ice page. As this clearly shows its been the Arctic where alot of the warming during January has been taking place. Except the Satellites don’t cover it all and there are very few Weather stations there either. lf you look at the 30 day anomaly map you will notice that there has been cooling in central Asia along with the eastern side of N America. This has been due to Polar air moving down across these area’s. When this Polar air flooded south you got warm pushing up into the Arctic to replace it. So l have little doubt that there was warming in the Arctic during January and that it would have had a bearing on the NH temps anomaly. It’s an artifact of low ice cover. Water is buffered to near freezing where as an ice surface simply plummets in temperature. So you get a warm reading with low ice which is an indicator of the energy exhaust of planet earth. So is low Arctic ice a proxy for global heating or weather and sea currents? I personally believe that the Gulf Stream transports more energy out of the tropics than virtually anything and it probably helps keep the seas open in the Arctic. Is a strong Gulf Stream a sign of cooling or warming I ask? Yes it does show up nicely how these “cold events” over the NH can lead to a spike in temps in the Arctic. l find a good guide to what’s going on is the Global jet stream forecast. As it shows where and when the movement of air masses is taking place. To Don’s comment on cold air .if I boil water in a lidded pan with a good but not too tight a fit ,the build up of pressure from the steam will eventually lift the lid,&steam will exit till the pressure equalizes ,the lid then falls back &then the process will repeat (as long as heat continues to be supplied to the water. )Does this mean that the lid is lifted because cold air rushes in to displace it .? Unfortunately I do not trust them to tell the truth. Witht the Tropics, which is where maximum insolation occurs, cooling over 0.6C in less than 5 months there will not be the warmth to spread around. Where exactly is this anomalous high temperature area of the Northern Hemisphere? We have extreme cold across North America, Europe and Russia as well as snow in North Africa. Is China abnormally warm? Somewhere else in the Northern Hemisphere? Or just the Arctic, where there is a somewhat higher amount of open water and a severe deficit of inland temperature stations, thus requiring ridiculous infilling from marine temperatures? The raw numbers a re a load of cr@p! A deliberate load of cr@p.
John, you have to remember that the Satellites are measuring the heat leaving the Surface and doesn’t usually reflect what we experience on the surface. The point is the heat will come back very slowly with a “quiet sun”. Apparently the high temps aren’t in the Arctic, either. According to the Danish meteorological agency the mean temp above 80 degrees N is about 3C lower than last year. So, where are these high temperatures? There must be people dying of heat stroke somewhere! Sorry, A C. It sounds like you’re saying that there is heat at the surface which the satellites detect radiating away but somehow we are here and can’t detect it? You lost me. John, the temperature where the Satellite measures does not necessarily reflect the Tempereature underneath it, ie the jet stream is moving heat around the planet in the Atmosphere, whereas it may not be moving it around on the surface. We continuously see a major difference in the Tropospheric temps compared to the Surface temps. It will be interesting to see the Heat Globe to see where the Satellites think all this heat is, compared to what we have experienced. Indeed, anomalous anomalies strike again! And everywhere where there are no people, no temperature measurements. Its all in the Arctic and the Oceans. The fact that most people in the NH were rather COLD in January is totally beside the point. UAH tends to be a little less C**p than most is not saying a lot. Satellites don’t measure temperatures they try to measure ‘stuff’ that is stuck into over-complex computer models and out pops anomalous anomalies. It is all rubbish! The truth is, no-one has a clue what ‘global average temperatures’ are, what they are doing , what they have been. The best we have are real max and min temps from some recording stations that have been around for a long time without being moved and without being subsumed in buildings, runways etc. These are mainly in the US, UK and northern Europe. They tell us that a horizontal line is straight. If there is any very slight change its that winter and night mins are ever so slighly increasing, counterbalanced in the main by very slight decreases in summer max. Mildness is frightening don’t you know. The heat is here in Germany for a lon time now. No Winter – just November for months. So what you’re saying is that we’re having some downtrend warming. Okay, but where does the El Nino get its heat? Since our US government said there was no “pause”, I’m looking more for at the “trends”. And looking at the UAH temps since day one it appears the trend has been / is: sideways, down, up, sideways, down, up, down, up, sideways, down, up, down, up and now.. down. I’m pretty sure the down thing is in place for a bit as the whole world is trending blue and we all know what that means. After that I’m not so sure. You see, this is what really annoys me about the AGW scam. 0.5 degrees in 100 yrs, 0.5 degrees in 30yrs and 0.15 C in a month. Do you see the problem? And 10 degrees overnight. But remember that measuring in different places in the garden yields results that are several degrees away from the official readings read 8 am at the airport. Hyping 0.2 degrees per decade is not so intelligent. Am also expecting this month’s temp anomaly to come in lower as well. As l expect to see lots of cold air flooding down over N America for at least the next 2 weeks. To a lesser extent l also expect to see this happening over northern and central Russia as well. Plus l also expect the mid eastern Pacific will remain cool over this month as well. So is it cool enough yet for me to come out of my bunker? Without the “SatanicCO2 Meme” the scientists will run out of things to research methinks. Meanwhile they need to keep a close eye on the domestic consumption of sandwiches as there appears to be a clear correlation. /? Perhaps we should all pause to reflect that the chaotic nature of the climate system cannot be dragooned into prediction by the use of linear equations and statistical manipulations. Proving negatives is a fool’s activity. Perhaps I am getting very cynical; although still interested in the remarkable technical tools now available. Just wish there be more common sense with brains extracted from computer data. Straws mate, jail time in Cali for serving straws with a drink. Adjusted data for all the land based datasets and now also RSS, sorry that just doesn’t cut it any more. And how, pray tell, does one remove solar variability when it isn’t known? Don’t they usually use sun spots as a proxy? 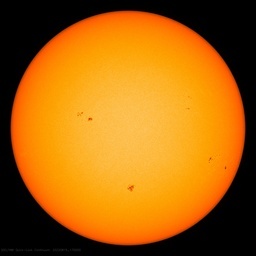 More sun spots means a more active sun. Non-science propaganda pap, at its worst. Such a palava over one month’s figures? Sceptics grinning from ear to ear? Last month the warmists were dusting off their jackboots. The difference? o,15 degree C. All rather silly. Calm down, lads. Solar activity may have a role but ‘the concuss’ says it doesn’t. Sunspot numbers went down a bit in January. The old historic Wolf’s SSN is around 4 points while the new ‘corrected’ SIDC number is at 6.7, corresponding 2017 annual numbers are at around 13 and 21.7 down form 23 and 40 in 2016. SC24 is nearing what might be the start of a prolong minimum with a possible late start of SC25. 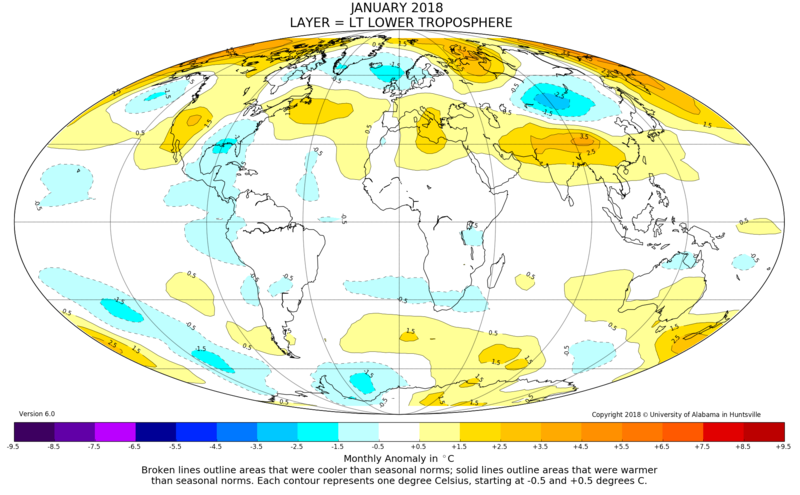 The Dec 2017 – Jan 2018 lower troposphere temperature change was -0.15C. If a similar drop occurs in the Jan – Feb 2018 span, we are right back on the ‘no global warming’ zero slope trend line extending from 1997. That is a useful ‘club’ to metaphorically thump the AGW protagonists about the head and shoulders with… but it’s still just temperature wiggle watching to a rational mind. Due to unprecedented unpopularity, here is my “What If” graph of UAH to reestablish the Pause. I have the Pause running from May, 1997 through Dec. 2015, with a value of +0.138 deg. The “What If” question is what does UAH look like for the Pause to reestablish within 24 months. I simply extend the data set by 24 months and add a value such that the usual LLS regression line from May 1997 to the present has a slope of .LT. or .EQ. 0.0 deg. The value I found according to this criteria is -0.11 deg. I note that this has to be the *average* for the entire 24 months. To me, it seems *possible*, given a strong cooling, but it does not really seem plausible. The temps would have to undergo one of the largest drops in the record, and then stay there for 2+ years. TonyL, actually all you need to do is wait five years until they adjust recent temperatures down. If you think that is a bad way to do science then take it up with Gavin the Schmidt and his adjustment henchmen. So, despite what has happened in the past you don’t think the temperatures can drop below -0.1 for very long. This is difficult not to agree with. Is a super-duper La Nina possible? Yes I suppose it is. But then that is also just a transient fluctuation; the steady, longer-term trend cannot be caused by the ENSO circulation. AC Osborn, not really possible with the +AMO. Tsk Tsk TonyL. Your side of the debate first said that a pause was impossible, then came up with dozens of explanations for it, then Karl adjusted the Argo bouys and claimed there never was a pause. You’re one meme behind dude. My side of the debate?? My Side? Since when have I said anything even remotely warmist? I just present the UAH data and some speculation, and everybody gets on my case about it. Are you guys all grouchy because of the influence of the full moon or something? Yes, I think that is what happened. Thanks for the suggestion. I always thought there were too many Tony characters running around this place. I still think davidmhoffer is grouchy because of the full moon. If the trend were to stabilize around the .14 C value over the next few years then I think rational folks would realize this was an extension of the pause. I ran UAH forward with a monthly average of 0.14 C to see how long it would take for a ‘pause’ (zero trend to 2 decimal places) starting in 1998 to re-establish. It would take until February 2030. TonyL is one of those “cooler heads” which we are told always prevail! If the trend were to stabilize around the .14 C value over the next few years then I think rational folks would realize this was an extension of the pause. It wouldn’t make the long term trend perfectly flat but really shouldn’t matter. That is just a timing issue. Your observation about a return of the pause is mathematically correct but scientifically of little relevance. If GSAT returns to values prior to the 2014-2016 El Niño (+0.15 in UAH graph) and remain there or below for over 4 years, then El Niño had a transient effect on temperatures and the pause, defined as a period of insignificant net warming, never went away. So it is all down to how you define the pause. The 4 year period is because ENSO events can last for a couple of years and be followed by a correction that can last another two. We have to discard the possibility that a La Niña, following the 2014-2016 El Niño, is responsible for a compensating transient downward spike. I am personally convinced that the pause is linked to the Eddy extended solar minimum and the 60-year oscillation whose period is tuned to solar cycles. Therefore it has not gone away and will remain with us until at least 2035. Temperatures might actually go down a bit (~ -0.2° C below 2003-2013 mean) over the next 15 years. Time will tell. If I am wrong global warming should accelerate over the next decade instead. But just in case, Hansen and Schmidt are joining me in their predictions. Hilarious. A linear trend is very affected by having a big deviation near one of the extremes. The influence of 2014-16 El Niño will affect the trend positively until it is in the middle of the period considered, and it will affect the trend negatively once it is in the first half of the period considered. This is basic mathematics and needs to be understood when discussing what the trend really represents. If and when Arctic ice max returns to levels approximating pre-1980 we will feel the effects of winter weather coming off of Arctic ice instead of Arctic marine conditions. This will make discussion of “pauses” irrelevant as we deal with crops lost to frost and wicked winter conditions penetrating farther South. The Arctic loses heat during the long winter night. The more open water there is, the more heat it loses. The more heat it loses the cooler the sea becomes and the more ice grows, reflecting more heat back to space when the sun returns North. Virtually ALL of the high temperature anomaly globally is represented by the Arctic anomaly. This is nearly ALL a result of the open water present-which is mainly a function of ocean surface temperature- not air temperature. Albedo- High ice extent acts to reinforce summer heat loss (or retard summer heat gain), extending the high ice extent portion of the cycle. High ice extent also reduces the heat loss from the ocean surface which allows the slow warming of the ocean until ice extent and thickness are not sustainable. Low ice extent acts to reinforce the high summer heat gain portion of the cycle. This exacerbates the warming of the ocean surface temps and extends the low ice extent portion of the cycle. Eventually the higher rate of heat loss from open water cools the ocean surface and the growth of ice extent begins again. Clouds- Low ice extent may mean more clouds and warmer winter temps but low air temps probably mean this is not so relevant. High ice extent would therefore mean less cloud and the increased albedo would have a clearer path to space. All reinforcing lags in a natural cycle. This is why it takes 30 or even 60 years to repeat. It takes that long for the Arctic ocean to warm or cool by whatever the balance point difference is. 1C? 7 An actual tipping point! The big deal if one can call it that is that the effect on temperatures in the Northern Hemisphere is somewhat greater. Not seriously significant but ‘sh!t your pants” for the AGW crowd! We should be studying this because when the next glaciation starts it will be because something has happened to cut off this cycle and prevent the Arctic ocean from accumulating that critical little bit of heat in its high ice extent phase. Then we really will have something to worry about. Your chart looks exactly what I did with one or two exceptions. I refined the data into annual averages. I also did a statistical test to determine if the average did change (which it did), then tested to see how good a fit the linear trend was to the data (it really wasn’t). The primary error points occurred in 1998 and 2016. So the linear trend is not very robust. However, you do have no significant evidence of a change in the average from 1979 to 1997. That is 18 years. You also have no evidence of a change in the average from 1999 to 2018. The year 1998 is an outlier. That would indicate some type of significant event. So other than 1998 you basically have two plateaus with a greater than zero chance of some type of shift in 2016. The magnitude of differential between those two plateaus is a bit less than .25°. That really puts the entire thing into perspective. At less than .25° you are talking zero significance. What is the measurement variability and accuracy? You have no idea. You know it is greater than zero. The only question is what is the upper bound on measurement variability? How would you even measure that when by definition a temperature measurement is a one time event. It cannot be replicated at a different lab or against a known standard. Less than 1/4 degree is arguing over nothing. When compared against the inherent day to day, moment by moment variability of even a single location with controlled conditions and rigorous quality checks it is basically zero. 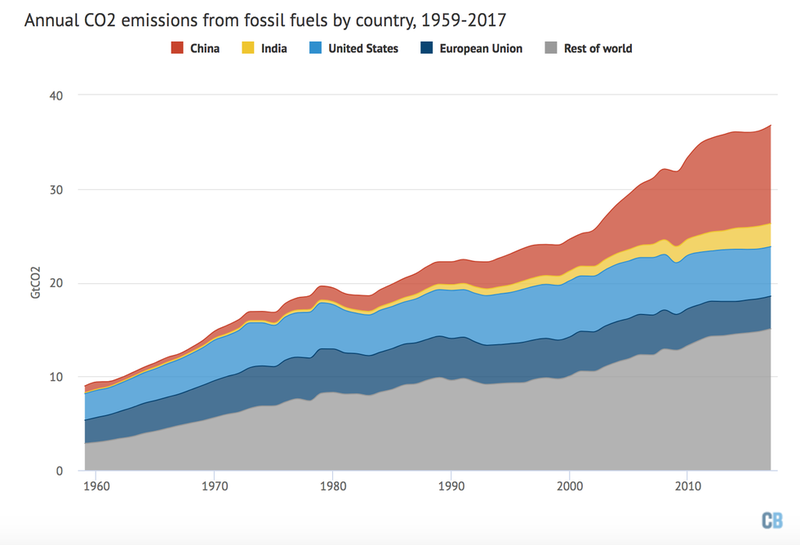 The growth in atmospheric CO2 is also down at around 2 ppm/year, following the temperature, and in spite of human emissions from fossil fuels and industry reaching a record high of 37 Gt CO2/year (4.8 ppm/year) in 2017. The NOAA growth reported for 2017 is 2.1 ppm (it will be finally corrected with the March value, probably downwards). So, the airborne fraction is continuing its downward trend – the consensus prediction was that the sinks would saturate and the AF would increase. “So, the airborne fraction is continuing its downward trend” which is a disaster for life on this planet. Fire-up the coal generator we need some CO2! And no I’m not being sarcastic, life on this planet needs much more CO2 to thrive. Seven of the 11 years between 2004 and 2014 had negative ENSO values as they were affected by natural cooling caused by La Nina conditions. So it’s not surprising that you get a flat sea surface temperature trend over that period. Using 2004 as the start of your trend (why not a longer period?) is another example of counting the natural cooling but excluding the natural warming variations. 2004 marks the millennial cycle temperature turning point with a 12/13 year delay from the solar activity peak at 1991. Because of the thermal inertia of the oceans there is a varying lag between the solar activity peak and the corresponding peak in the different climate metrics. There is a 13+/- year delay between the solar activity “Golden Spike” 1991 peak and the millennial cyclic “Golden Spike” temperature peak seen in the RSS data at 2003 in Fig. 4. It has been independently estimated that there is about a 12-year lag between the cosmic ray flux and the temperature data – Fig. 3 in Usoskin (28). So if the chart was showing the value of your financial investments, would you feel the values were rising or falling over the last 40 years ? Falling, as it would not be keeping up with inflation. Gareth, you have invited us to take a financial analogy , so lets do it . The global mean temperature of the Earth is 15C or 288K. The increase in 40 years( the length of the average working lifetime) is of the order of 0.4K ,ie if that was a financial investment at the start of my working life , then my investments would have accrued all of 0.14% by the eve of retirement. I would then have wished I had picked a better financial advisor . The question is rising or falling? 1. The reason Celsius is preferred to Kelvin when considering average global surface temperature is because Celsius is a much better calibrated scale to describe the important changes that relatively small variations can create. For example, during the ‘Little Ice Age’, Northern Hemisphere temperatures are estimated to have been ~0.5C below pre-industrial on average. In Kelvin that’s a difference of just 0.18% (272.5K versus 273K); yet it was sufficient for the whole period to be called, well, ‘The Little Ice Age’. The peak of the last glacial maximum was about 1.5% cooler than modern temperatures on the Kelvin scale! Clearly small variations in temperature matter when global average surface temperatures are concerned. Using Celsius basically resets 273K as zero C for very practical reasons. It’s more useful as a guide to meaningful global temperature change than K is for the reasons described above. Using C as the base then, and applying your interest analogy, over the past 40 years global average surface temperature has increased from ~14.3C to ~15.0C; an increase of about 14%. I think we’d all keep a financial adviser who earned that return. Sorry, my second point was that total surface warming over the past 40 years is in the order of 0.7C (or K), not 0.4. That’s where I derived the 14% increase figure from. The chart speaks for itself, but left out of consideration is what does CO2 have to do with what that chart shows. Given that since 1998 around 35% of the total human generated increase of atmospheric CO2 was produced. What was it that CO2 was supposed to be doing? Alternatively, the chart shows that you should have cashed out somewhere in 1997/98. I wouldn’t be using an anomaly based on 30 year averages but whether the value had actually gone up. And whether it had gone up by a meaningful amount. On that basis I would say meh. President Trump is making climate great again! Except for the El Nino pops, the whole recent so called ‘global temperature’ is within the REAL statistical margin of error. But it is fun arguing over the exact length of the unicorn’s horn even when you know that they have photoshopped the old pictures of them to make their horns look shorter. This a crock! There is NO “global” warming. All we have is Arctic Warming. The rest of the globe looks pretty tame. I like dr Spencer … but … I’m not sure they have this arctic thing down yet. Simply no way that the arctic is running away. Having just returned from Mongolia, I can attest to the below average temperatures in that area. It was so cold in Yakutia in January that 70 people lost limbs to amputation for frostbite in one event two weeks ago when the temperature dropped to -68 C. Photos show frost collecting on people’s eyelashes, water vapour from their warm eyes frozen only 5mm away. Ulaanbaatar was stunningly cold and windy. Gah! At -78°C the CO2 starts to freeze out. Some people claim the satellites don’t measure the surface temperature. I was putting the emphasis on “the surface”. That’s why I ended the phrase where I did. If you want to know what the current temperature is in the arctic google: Alert Nunavut weather. This is the most northerly continuously occupied community in the world, only 500 km from the north pole.. here you can see what they mean by warm. I did For Feb 1, 2018 the actual temp is -31C with a wind chill of -49 You dont want to be outside in that temp because your face freezes in minutes. The people in Alert Nunavut Canada wouldnt mind a little global warming. It is roughly a tenth of a degree per decade. Which is the same as it has been since the end of the Little Ice Age. No catastrophe. No climageddon. No starving polar bears. Just moderate warming, which will come to end, when this cycle ends. But there is no money to be made in “moderate warming”. Warmest year “evah”, get you trips to exotic locations to discuss the “steps required to save the world”, from the evil molecule that makes life as we know it, possible on this planet. Below is the link that I believe is the smoking gun in climate science. He came to his conclusions over a number of years and the above paper though undated is from around 2013. And my high school teacher beat you both by 40 years, anybody educated then would have been taught a derivative of gas law derived temps and mechanisms. I was taught 83% of the surface energy travels sensibly to the TOA. 17% via photon [Radiation]. Exactly. N2 and O2 are the greenhouse gases in the atmosphere and they work exactly like an actual greenhouse – by preventing convecting cooling, not allowing warmed air to escape, except by transfering heat to the radiatively more active gases, which can radiate the heat to space. The way I have described it is that descending columns of air that comprise half the atmosphere at any given moment suppress convection from the surface just as does the physical barrier of a greenhouse roof and by dissipating clouds allow solar radiation through to the surface just as does the transparency of the greenhouse roof. The greenhouse effect is a consequence of non radiative gases rather than radiative gases. Total incompetence within the climatological establishment. How can more optically active gasses trap energy, when there whole purpose is to emit within nano-seconds any energy absorbed once optically active. You have to wonder at peoples mentalities, how else does the skin burning state of energy, hot air in a desert get to space. heat expands and rises, it only exists at the boundary of the expansion, heat cannot flow back into itself. All photons have thermal potential. Only the photons of a wavelength [frequency] [electron voltage] that the absorb-er does not possess will act thermally [ create work ] and alter energy state, they are the only thermal part of the flux, the rest of the photons are just instantly replacing each other between emitting surfaces. You only have to look at equilibrium state of 2 objects to see thermal potential means nothing, then warm one .by 1c. Nothing changes except now one is emitting thermal photons of a frequency the other does not have, and those higher electron volt charges get to work, until equilibrium is again achieved. And the instant exchange of identical electron voltages is attained between the 2 objects. Incorrect, vibrationally excited CO2 takes on average milliseconds to emit their excess energy, in the meantime the molecule is colliding with surrounding molecules (mostly N2 and O2) about 10 times per nanosecond. Consequently in the lower atmosphere much of that energy is used to heat nonGHG molecules. Only those photons which exactly match the energy difference between the ground vibrational state and a ro-vib excited state are absorbed, and by definition the temperature of the molecule is unaffected. When we’re talking about gases we have to use quantum mechanics, it doesn’t behave the way you seem to think. Are you serious? CO2 has been known to be a greenhouse gas since 1896. It’s been amply demonstrated. Do you think physicists would have gotten something that basic wrong all these years? That’s hilarious! Looks like the work of a high school kid. Gosh Kristi, NOBODY denies that CO2 is an IR absorbing gas. NOBODY! That 1896 reference was updated by Arrhenius in 1906 where he greatly dialed back his earlier warm forcing estimate and said CO2 is a good greenhouse gas. You are so far behind……….. Sorry, I didn’t mean the comments here looked like the work of a high school kid, I meant the paper in Alan’s link. I should really have said, “CO2 has been THOUGHT to be a greenhouse gas…” since at that point it was theoretical as a climate phenomenon, although the relevant properties of CO2 had been demonstrated in the lab. Gosh, Sunsettommy, your comment is irrelevant! There were several people doing research on this around the turn of the 20th C; I wasn’t even thinking of Arrhenius, but Nils Eckholm.. Whether they concluded it is “good” or “bad” was not my point; it’s still a greenhouse gas, and it’s has been studied in that respect for 120 years. Once again, your comment is irrelevant. I’m behind, eh? You are up-to-date with all the latest climate science, I suppose? Does that mean you have all the answers to show why it’s garbage? The thing is, it’s very easy to call something garbage that one doesn’t understand. It’s very easy to think of reasons it’s not correct or scientific when one doesn’t have to discuss it with those whose work one is criticizing. Why are you after me? I don’t care what you think and have no use for your comments, which are neither edifiying nor entertaining. You can insult me all you want and it will not hurt me. I will enjoy reading his work, as i like Mr Wilds work also. Radiating gasses radiate, the 1% services the trapped energy in the 99%. The more radiating gasses the greater the radiating to space, thats the opposite of ”trapping” energy and global warming. It is after all the original CO2 ”science” of global cooling back in the 70s when we were taught about it. Too much co2, too much energy slowly leaking away above the normal balance, and a human induced ice age. That paper is a load of junk and contains some weird misconceptions about physical chemistry. Hopefully the electorate everywhere get the message — the amount of so called warming is piffling, a non-event. Yes after 25-30 years the planet has, to all intense and purposes, heated and cool by just over a half of a degree. Arguably it is all natural warming, certainly it is within the range of normal natural warming. Gawd get a grip! Get some perspective people! Most people and nature survive a daily change of 2-10°C, often more. A mere ~0.5°C is not going to harm anything. Even if it went up 2°C life on this planet can EASILY cope, it has done it before, it can still do again. Only the circle jerks of CO2 obsessive think otherwise! Whether candy assed, middle class, comfortably off American and Europeans can survive such warming without causing a ruckus is debatable, as they have a long proven track record of being ill-equipped for rapid change (usually just starting a war somewhere when overstressed) — in the meantime the rest of the natural world will get along just fine. For all you that think otherwise, examine the history of this planet for the last 10 million years, then readjust your priorities. The UN-IPCC is just plain wrong — get over it. On the other hand if this planet’s temperature falls by 1°C most of us will be in dire hardship. I agree Tom, I’d rather see several degrees of warming than one degree of cooling. According to my calculations, though, we’d better bundle up. You see, Wikipedia, the gold standard on climate matters, tells me that climate is thirty years of weather. I looked at 1988 on the UAH chart above, and it was about 0.12 degrees warmer than now. By definition, we have a cooling climate. In those thirty years of cooling, we’ve pumped about forty percent of the man made carbon pollution into the air. By climate science standards, that’s irrefutable proof that CO2 causes cooling. Sure, it would take 250 years to reach one degree at that rate, but, as it gets colder, we’ll burn more fossil fuels to keep warm, spewing more carbon, which makes it colder, which makes us burn more fossil fuels, which… It will be both a figurative and a literal snowball effect, leading to an inverted Mannian hockey stick. Scary! Now, if I could learn to say that with a straight face and both hands in your pockets, I could be the next Manbearpig. Get the message CO2 is NOT a pollutant, it can not control global temperatures, it is REQUIRED for life to thrive on this planet. Restricting CO2 output from wherever, manmade or nature, is an act against life. Stop reciting nonsense about CO2. CO2 is a very, very minor part of our atmosphere and an innocent gas, it does not change the temperature of this planet. I repeat CO2 does not change the temperature of this planet. And life on this planet could do with it being at 800 to 1000ppm MINIMUM! PIFFLE? How dare you piffle me. Just kidding, Tom. Whenever Anthony pokes the warmists by posting a story about unusually cold weather somewhere, the warmists have to respond. They usually post a map showing that every uninhabited part of the world with no temperature sensors is extremely warm. Then they point out that it’s just weather, and it takes thirty years to establish a trend. When I saw that thirty years ago (1988) was an extreme outlier, I went into Alarmist mode. If they can use the end of the LIA and 1979 as starting points, I can use 1988. Extending the transient trend line indefinitely into the future wasn’t scary enough, so I added a positive feedback based on the time honored scientific axiom that correlation equals causation. I added an appeal to authority (Wikipedia), and invoked the Mannian method to add gravitas to my theory. Then I used every derogatory term I could think of for plant food to show my fellow alarmists how serious I am. I thought my absurd theory, my anti-science defense of it, and my over-the-top descriptors would make it obvious that it was a spoof. But, now that I’ve read it in the light of day, I see I should have included a sarc tag. Sadly, I’ve seen worse arguments made in earnest here. I appreciate the input from Nick, Toneb, Gareth, and the like – they’re civil and knowledgeable, and they keep this site from being an echo chamber. But the warmist trolls, many of whom seem to have retreated to their safe spaces, really are beyond parody. +1!! A measly 0.13 rise, or fall, per decade is truly piffle. Places experience large variances over months, let alone days. Even Jan2018 had +5C above norm in one locale and another gets -3c below norm anomoly… Same month. according to spencer. But averaging them is nonsensical as averaging the visibilty across Day and night. Nope. Earth’s warming almost 10 times faster than it has during recovery from any ice age in the last 800,000 years. Funny how you’re so certain..
” in the meantime the rest of the natural world will get along just fine. It does depend on priorities, doesn’t it? The planet has remained inhabited since life began. It also went through some pretty big extinctions, but something always got by. No sense in being apocalyptic about this whole thing. t puzzles me to no end why people think they know better than the thousands who have spent their lives studying the current and potential effects of climate change. I just don’t get it! Are you unaware of them, or do you reject them? Is it untrue that the shells aren’t developing properly on some organisms because of increased pH? Or that southern Florida and Hawaii experience flooding from king tides they rarely did before? Are there no negative effects, or just none that will affect you? What bothers me more than people denying global warming is people saying climate scientists are corrupt and/or stupid, and the science is baloney. This is just wrong, baseless, and very disturbing, since it shows how millions of people can be manipulated into thinking a particular group is corrupt.- and not just any group, but a worldwide, very loosely bound group in a profession that demands integrity. It has its problems, but there’s no room for scientific misconduct, for intentional manipulation of results. Science is all about eliminating bias, being skeptical, debating and critiquing others’ work. People here seem to think that research by vocal contrarians isn’t given serious attention, but that is not the case at all. 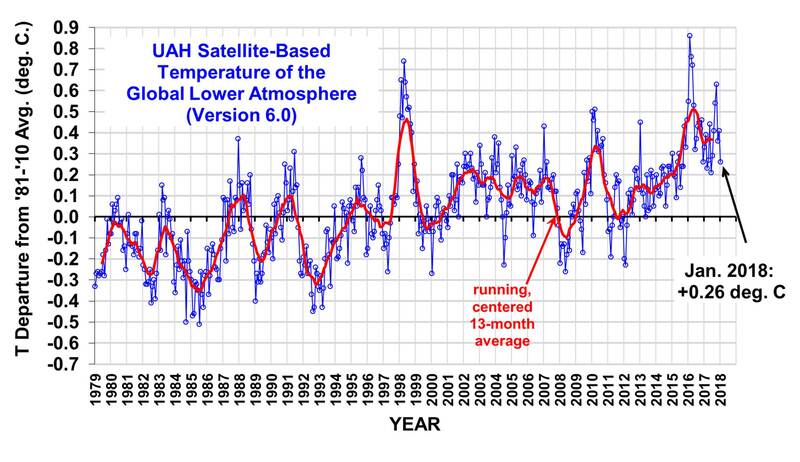 Anthony Watts’s data on temperature recorders led to research at NOAA, for example (a very good example of legitimate data adjustment, by the way, discussed https://www.ncdc.noaa.gov/ushcn/station-siting with graphs in the paper itself). Why are science and data trusted when used to make or support a Skeptic argument, but not trusted otherwise? “What bothers me more than people denying global warming is people saying climate scientists are corrupt and/or stupid, and the science is baloney. This is just wrong, baseless, and very disturbing, since it shows how millions of people can be manipulated into thinking a particular group is corrupt.- and not just any group, but a worldwide, very loosely bound group in a profession that demands integrity. It has its problems, but there’s no room for scientific misconduct, for intentional manipulation of results. Science is all about eliminating bias, being skeptical, debating and critiquing others’ work. People here seem to think that research by vocal contrarians isn’t given serious attention, but that is not the case at all. Anthony Watts’s data on temperature recorders led to research at NOAA, for example (a very good example of legitimate data adjustment, by the way, discussed https://www.ncdc.noaa.gov/ushcn/station-siting with graphs in the paper itself). Who is denying global warming? NOAA is NOT GISS, why can’t you figure out the difference? The post is about UAH temperature data, which you seem to ignore as you want to whine about something not talked about here. He is correct as I myself pointed out to you SEVERAL times about their failed PER DECADE warming trends prediction/projection since 1990, which you NEVER reply to. They are also wrong about the “hot spot” too, which was supposed to warm about THREE TIMES faster than the surface warming rate. Instead it is only 1/3 rate at one level and a slight cooling at the other level. I doubt you even know what the IPCC said on those two failures in the first place since you replied to tomOmason with a long winded babble that has NOTHING to do with his statement at all. You are proving to lousy at this and clearly ignorant since you NEVER get down into debating the details, you specialize in long winded non science replies, which exposes you as a beginner in this arena. You need to lift your game here or get laughed at some more. Is it untrue that the shells aren’t developing properly on some organisms because of increased pH? Yes I am aware that they put acid in the tank and that it does not reflect how the natural world works. Their research was faulty and proved nothing about natural processes. Other later and less well hyped research papers have come out with results that are quite different if not contrary to the ones you allude to. Understand when you pay for research into areas of natural processes that are poorly understood in the long term, researcher tend to confirm what ever is the conventional view of the day. It’s called confirmation bias and this so called ‘climate science’ is riven with it. I therefore view ALL climate research that claims some bad outcome or other as caused by CO2 as suspect until widely verified. Can you name one research paper that shows the benefits of more CO2 in the atmosphere — no I thought you couldn’t. Yet nature has survive — no thrived — in high CO2 atmospheres of the past! As for Miami and it’s king tide please can you research further to see what a non-event it is. Hawaii experience flooding? Hardly unexpected as it is an active volcanic island and therefore not a stable platform in the sea. I say again “The UN-IPCC is just plain wrong — get over it”. Please learn that the UN-IPCC is about politics not the disinterested advancement of science. You are thinking of other research and should not be so quick to assume what I know.. I’m thinking of research on marine organisms in situ, in the open ocean. It was also a problem for the Pacific Oyster industry on the NW coast, which was collapsing until they began to buffer hatchery water. This is not just a theoretical problem when a $100 million dollar industry loses 80% of its stock. (Adding acid to sea water for experimental purposes is in itself perfectly legitimate. What makes the research you refer to faulty? Care to post a link?). If this were true there could never be scientific advancement. It seems to me you don’t understand scientific methodology or the procedures used to overcome bias, and you vastly underestimate the ability and integrity of the scientific community.. Bias is an extremely well-recognized issue in science, and has been for millennia. Confirmation bias is when one seeks the information that will support what one thinks In research people seek information, sure, but they also produce information, and that information is not known ahead of time or it would be pointless (and boring) to seek it. There are many procedures designed to minimize bias in scientific research. Of course, they are not always completely effective, but the point is that scientists are trained in the management of bias and cognizant of the things that can affect it. The average layman is not. What is this site but a gathering place for those with a desire for confirmation bias? Details vary, but nearly all here share a belief that climate models and the majority of climate scientists are untrustworthy. Those who believe differently are told to go away – their comments are not wanted. What do you call “widely verified”? What’s your standard? How will you know what’s widely verified if you don’t look for or believe the verifying research? Whether I can name a research paper about benefits offhand is irrelevant. They may be out there, but that doesn’t mean they are true. You seem to have limited understanding of the ways in which organisms and ecosystems are likely to respond to elevated CO2. The level of CO2 in the atmosphere has not been this high for over 800,000 years, during which time the biota had presumably adapted to the limited fluctuation in CO2 levels. When change happens are rapidly as it has in the last hundred years, not all organisms can evolve quickly enough to thrive. I find that in general “skeptics” have a very simplistic way of seeing the relationship between “nature” and climate/CO2; it’s a topic that they are not likely to research. “Please learn that the UN-IPCC is about politics not the disinterested advancement of science.” Learn??? This is nothing but unsupported opinion, so from whom an I supposed to learn it? Why should I believe you? Do the IPCC reports advocate a political agenda? Although the UN has many problems and is very political, to dismiss the IPCC or its reports as a mere political tool is yet another easy excuse for ignoring and discrediting it. There are dozens of excuses for discrediting scientists without ever identifying particular problems with their methods. Accusations need no proof to be believed. It’s easy to win an argument against someone who’s not part of the conversation. And you’re trying to explain confirmation bias to me??? How ironic. Did you get the concept from Judith Curry, by any chance? I’m just curious, since I know she has discussed it in Congressional testimony (fascinating for being such a brilliant piece of propaganda. I have a feeling she’s quite familiar with the psychology of manipulation). Ya think? Light weight drive-by troll, that’s pretty funny. I wonder why you say that. I used to spend my time at Breitbart. Posted hundreds of times about climate, much more respectfully than I was treated, but I must have become a threat to someone’s agenda because I was banned. It takes a lot to be banned from BB. So much for free speech and “More voices, not less,” Andrew Breitbart’s motto. WUWT is a more diverse than BB, it’s a nice change. Kristi, I think you are one of those people who are mostly into looking at this from a Philosophical standpoint, since you shy away from harder science all the time so far. Agree they have many problems, but you seem to suggest they deserve a second chance? Have you forgotten how many times they have been wrong scientifically, that they accepted many “grey” papers, that it is under control the UN Governments? The funny part is that I see that Skeptics know a lot more about what is IN the IPCC reports than warmist/alarmists do because they are more into the science and data, while Warmists/alarmists are more into government and environmentalist propaganda, try control the information of credible science research by placing roadblocks in the way. I have several times mentioned failures of the IPCC prediction/projections to you, always gets ignored. I think it is because it is something you know you can’t debate on because deep down you know it is true. Comparison of UAH-LT, RSS-LT and GISS (raw data doesn’t include Jan yet). Baselines set to match at start of 1979.
and yet where I sit in California’s central valley we are have unusually warm February weather of 70F+ highs for the next 10 days or so. This should keep all the faithful westcoasters believing in the righteousness of there cause. And its kinda nice too. The important thing that everybody should note is that right now GSAT is elevated because NH average temperature is elevated. And NHAT temperature is elevated mainly because Arctic temperature is elevated. 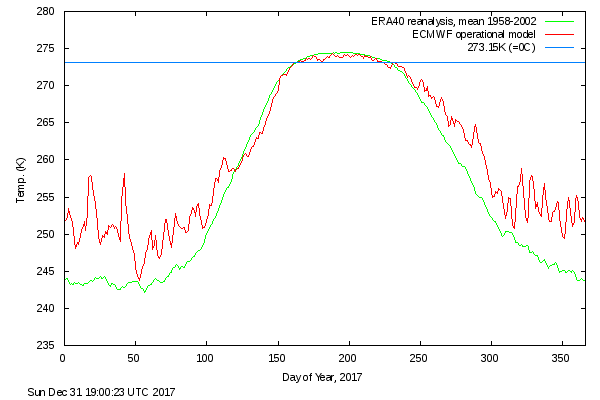 High winter Arctic temperatures are due to heat advection from the South, and most of that heat escapes the planet as LWIR. By past experience the Arctic positive anomaly vanishes around day 125 (early May). 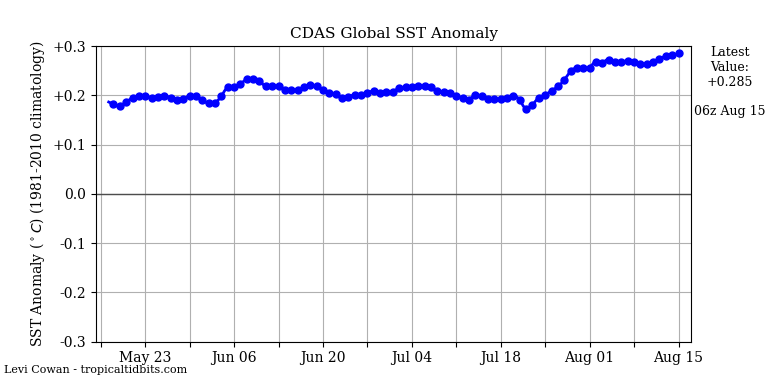 Last year GSAT anomaly started to drop significantly in April due to this cause. This year we even have a cooling influence from a weak La Niña that is going to intensify its effect on GSAT over the coming months, as Allan McRae is telling us above. This is going to be a double whammy on temperatures. It is very easy to predict a significant drop in GSAT starting at the end of winter that should continue at least until the summer. With almost absolute certainty, 2018 will be colder than 2017. I can also predict that they will tell us that it is the warmest La Niña year on record. Despite the weak La Niña conditions in the Pacific, it is unclear at this time that this will be a La Niña year. A la Niña event used to require five continued three-month averaged Niño 3.4 below -0.5°C anomaly months to be declared. But they are known for bending their own rules. Yep …. I agree whole heartedly. Looking at the global anomaly graph above, there is no global warming, there is only arctic warming. Interestingly, the arctic temp NEVER goes above a certain max, and all of the yearly anomaly is driven by warmer lows in the winter. Thus, the arctic warmed from -50 to -45, … and in the CAGW mind that means catastrophe for the whole globe. Here’s a nice chart that shows the elevated winter temperatures being driven by the Arctic warming. What one needs to know is the meaning of that Arctic winter warming. To a warmunist “The Arctic is in fire,” as I read recently. To a more nuanced observer, Arctic winter warming essentially means a more efficiently cooling Earth. Whether that means good news or bad news depends on point of view. Afonzarelli, here is the explanation for the change in variability (cycling) in arctic sea ice. It might be the same for the sst. The annual cycle changed (amplitude increased). Why are you using the UAH data when it is borderline garbage? It’s at version 6 already, right? Why the constant need for “adjustments”, I thought you don’t like that kind of thing here? 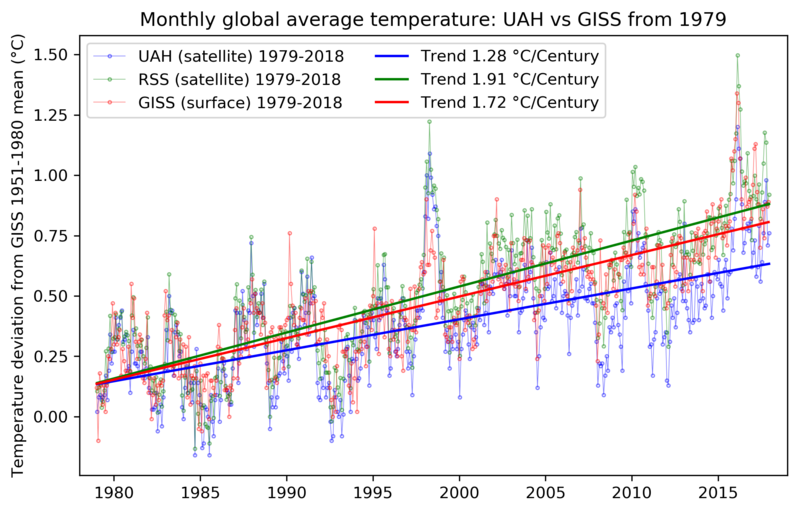 UAH 6 corrects the spurious warming trend that developed over recent years, but it also generally warms the overall data with less extreme declines. The UAH also showed more warming for years compared with RSS, when the RSS showed the least warming before its recent adjustment. Don’t forget they really shouldn’t be exactly the same because RSS surface cover goes up to 70N and 70S, whereas UAH covers much larger areas of the poles and represents them much better to 82.5N and 82.5 S.
UAH 5 showed more warming than RSS. Despite the above link showing warming because of El Niño developing near the end. The pause was shown clearly here missing out the previous strong El Niño, corresponding La Nina and the recent event using surface, ocean and satellite temperatures. Finally the UAH during the pause showed the spurious warming trend, so how could it have had a spurious cooling trend? It didn’t have one because HADCRUT 4, HADSST 3 and even RSS showed more cooling.